This cloth is a larger version of our #382 silky cloth. It has a nicely finished sewn edge and is tightly woven. It comes individually packaged. This cloth is ideal for screen cleaning on many types of devices, large or small. It is washable, reusable and long lasting. Uses include: Lens cleaning, LCD displays, industrial critical cleaning, cameras/camcorders, cell phones, optical/sun/safety glasses, LED read-outs/gauges, CDs/DVDs, promotional use and much more! Cloth Size 14" x 14"
Shipping Weight each 14" x 14"
540 case pcs: 43 lbs. Options Available for promotional use: embossing or color logos. Notes Great for screens, glass, mirrors, windows, industrial, critical, optical and hospital cleaning. Available Sizes 6" x 7" 6" x 7" 6" x 7" 6" x 7" 14" x 14" 12" x 16" 8" x 8" 8" x 12"
This is the second batch of silky micro fiber cloths that I have purchased. They are large and have a great quality feel to them. Not only that, but they are super silky smooth. I used them for cleaning my electronic's screens, glasses, and for my 8 inch telescope lenses. Only the best will do for that one. I recommend these to everyone I meet. You are wonderful, Jasen! Thanks for the feedback, and for the recommendations. Being a small business, word of mouth advertising is our best avenue, and we appreciate your helping us out! I purchase these cloths for my company to clean projector lenses, camera lenses, and other critical glass surfaces. They are large, and the fabric is thick and smooth. They are very durable. I will buy these over and over again. they are great for cleaning glasses, and they last for years. I keep buying more because I like them. Thanks for your repeat business, Douglas! Some of our cloths are great for cleaning just about anything! Received my order and am happy with it. The cloths are good and work well. Good news! Thanks for your business! Received two of these along with my purchase of several items. The large size of the cloth makes it very useful for cleaning our 60" and 46" LED TV's. The second one I gave to my wife to use in her 2016 Honda Pilot. The touch screen in the new Pilot has a major issue with retaining hand oils from every time it's touched. She told me last night that the size and fabric makes it perfect for cleaning the screen, that is until the Pilot screen protection I order arrives. Can't wait! Fantastic, Steve! 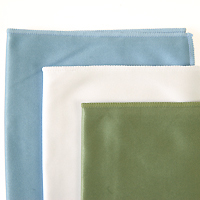 We'd recommend checking out our microfiber sample packs, which will give you some cloths to use for cleaning your car! I wanted a bigger size cloth that was easier to handle. The small cloths end up with you still getting fingerprints on lenses because they are small. These cloths are the perfect size. And yeah, you'd pay 5x more elsewhere. I find this to be an exquisite microfiber towel that is excellent for cleaning laboratory glassware because of its ideal texture, thickness, absorbency, and size, though I do wish it were available at an even bigger dimension. I also like that the towels arrive individually packed and ready to use, and they are indeed easily washable/reusable (do not use bleach or fabric softener). Shipping is very fast, but moderate and large-sized orders have rather high shipping rates. After all, these are small light-weight towels; the shipping rates should be proportionate/lower. The #383's are as large and silky as I had hoped!! They are higher quality and silkier than theirs I've purchased through my favorite camera retailer at 5 times the cost. Also, your shipping was very prompt. I appreciate the helpful info you included about caring for the products, too. Nothing can beat great customer service, and you delivered. I wanted you to know how much I love your microfiber products and the excellent value at which you offer them!! Consider me an ambassador for Photodon! these have been in use for a couple years now in A/V production to clean screens and lenses. They are large, which allows them to be used extensively or on very large surfaces before needing to be cleaned. The material is very smooth and absorbs screen-cleaning liquid well. Great cloths. Great product! Worked as expected. Unfortunately it's a bit wide to fit inside my laptop when closed which would have been handy. Also, I got the wrong promo item. I ordered it with a free iPhone protector but got the microfiber cloth instead. Obviously I bought the microfiber cloth so... Also, I should have ordered one light blue one and one olive green one--didn't realize they were separate packages. Great purchase overall. I am a wildlife photographer who wears glasses. When taking pictures the viewfinder presses my glasses against my skin and I have smeared glasses after a while. Coated glasses and lenses are delicate, hard to clean and they will smear if touched. I tried the #382 cloths out of the bag and they were the best. No streaks, no lint - just clean results. I have purchased other microfiber cloths from other sources and most left streaks and did not do the job. These cloths work much better than the professional products sold by the major camera makers. I will be ordering addition cloths to have in my vehicles, all camera bags, at my desk and other important places. Very happy with the product. These cloths have quickly removed all marks from my LCD TV without any signs of scratches. Together with the Optix cleaner you can't go wrong. I use these to protect my Lee 4x4 and 4x6 filters in there pouches. 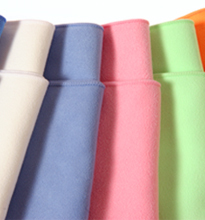 These large microfiber cloths are ideal for cleaning any surface that you might be afraid of scratching. This includes large screen Laser, LCD/LED, CRT screens. Also good for cleaning cell phone, tablet, and notebook screens. Excellent for cleaning eyeglasses. these clothes are a great size. price was great and shipping was VERY fast. I'm very happy with these clothes. I haven't had to wash any of these clothes yet so I don't know how they'll perform after washing, but even if they don't hold up after a few washes, who cares they're SO CHEAP!